Insurance fraud detection is a matter of understanding connections. To uncover scams, investigators look for anomalous links between people, events, locations and times. They scour huge, noisy, complex, and often incomplete, datasets to understand which connections are genuine, and which could indicate fraud. 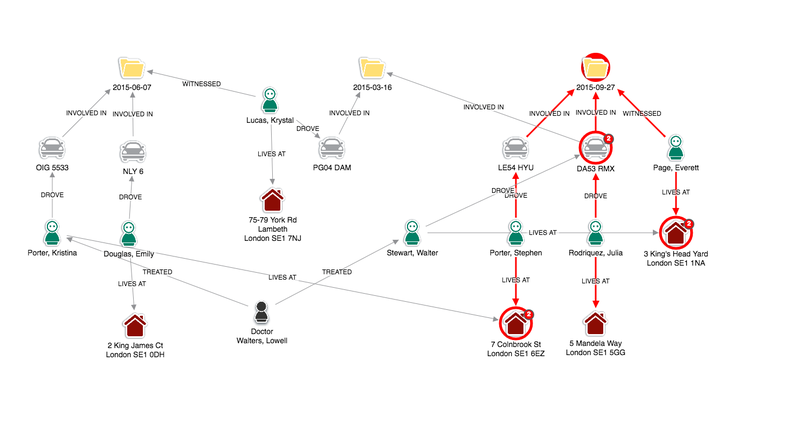 Network visualization (or ‘link analysis’ as it is more commonly called by fraud teams) has long been a vital part of the fraud investigators arsenal. Powerful and well-designed network visualization is the ideal tool to overcome data challenges and investigate fraud in an interactive and intuitive way. 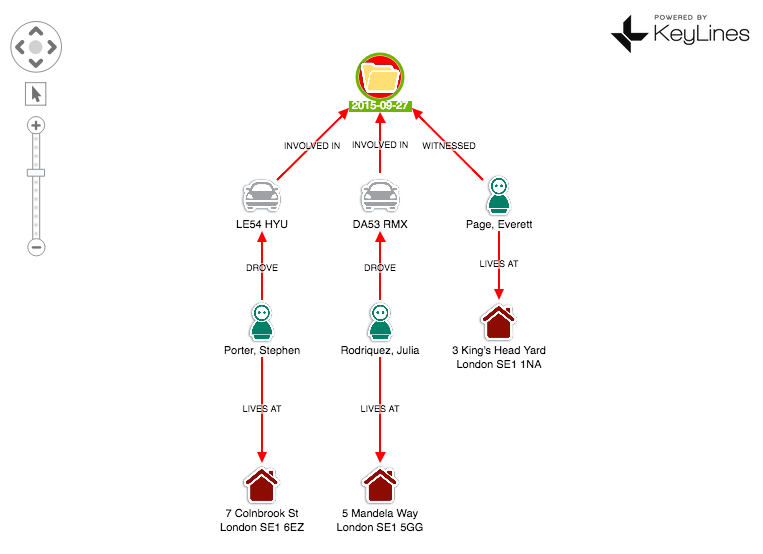 Below is an illustration of how the KeyLines network visualization toolkit has been used to investigate insurance claims. Most insurance fraud detection systems work in a similar way. Data is collated on a huge scale, rule scored and typically sorted into three categories: fraud, not fraud and unsure. A team of analysts then manually reviews the ‘unsures’ – a careful balancing act between keeping genuine customers happy with fast, accurate decisions and preventing real frauds from getting through. 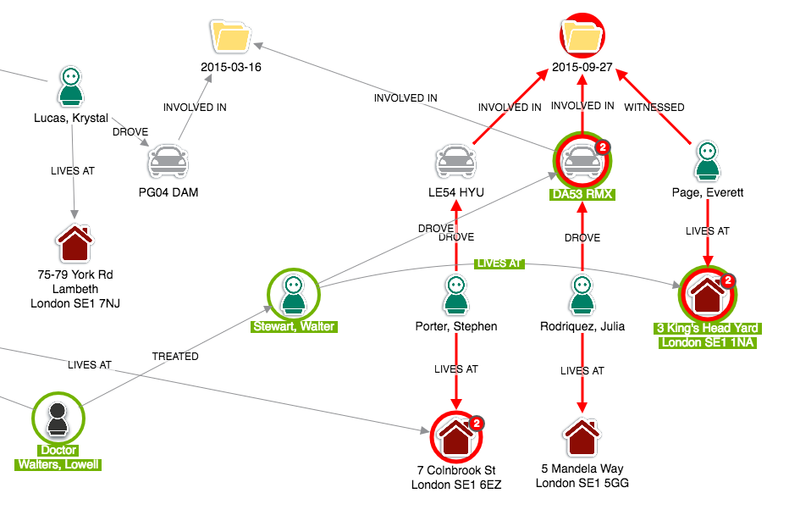 KeyLines is a great way of visually presenting these complex scenarios in a simple format, directly embedded in the investigation workflow. In a real-world deployment of a fraud visualization system, an investigator would be interested in a large number of data points. 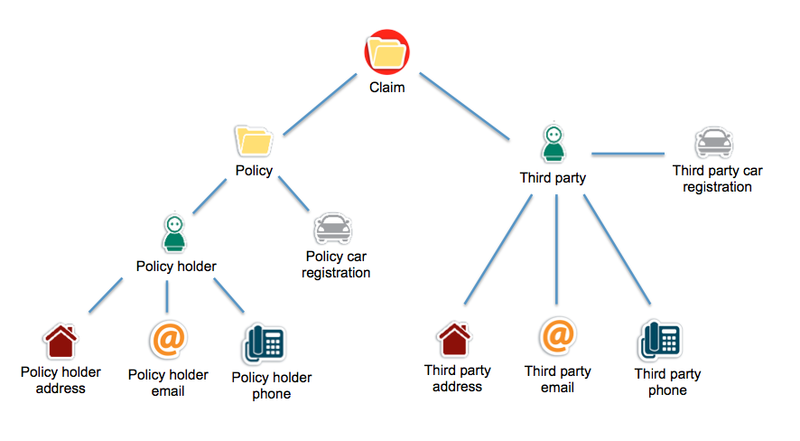 This model places claims and policies at the top of a hierarchy, with third party and policy holder information on the next level. This claim folder involves two vehicles and three claimants, associated with three separate addresses. Our first step is to load our disputed claim, using the hierarchy layout to simplify the view. In this example, we have two people (Stephen Porter and Julia Rodriguez) claiming for damage to their vehicles. An additional person, Everett Page, is included in the claim as a witness. Doing so returns two other claims – 2015-06-07 and 2015-03-16 – which show matches on the vehicle and address of a claimant in the original case being investigated. This adjusts the layout of our network so we can more easily see unusual connections. Here we can see our original claimant’s address in Colnbrook Street is associated with an earlier claim. Given they share a surname, however, it is not necessarily suspicious. This example is a more suspicious match. Our witness, Everett Page, shares an address with a man named Walter Stewart, who has previously made a claim relating to one of the vehicles involved in this incident. Representing data as a network offers an engaging way for analysts to rapidly understand events. 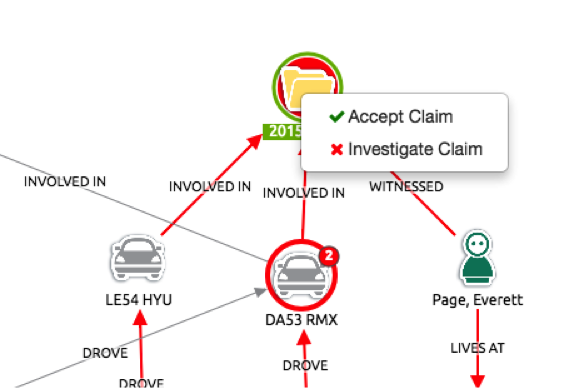 By incorporating KeyLines into existing claims management workflow, we have made the process simple and intuitive. This is a simple example, using synthesized data, of how KeyLines can make a complex and high-risk exercise simpler and more intuitive. 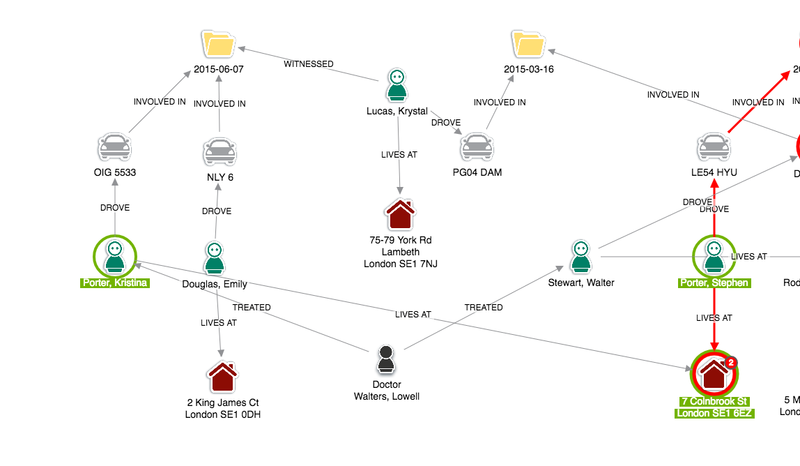 With the help of a number of KeyLines features, including layouts and combos, we have built simplified data from multiple policies into a single chart and identified a potential incidence of fraud. If you want to try KeyLines on your own data, just request a trial account. 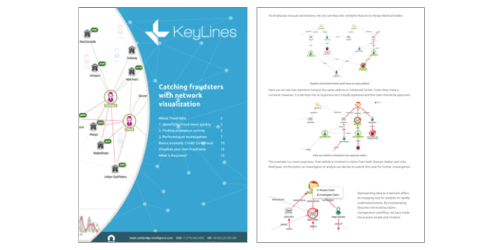 To learn more about KeyLines, download our updated white paper. 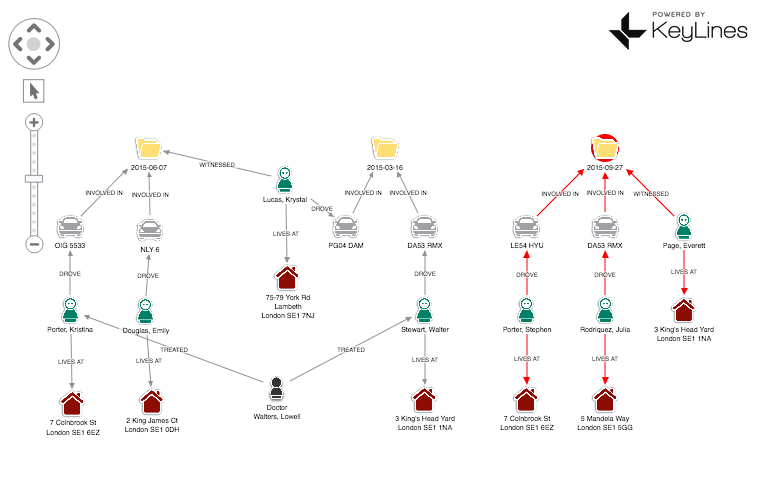 It contains three more in-depth examples of using graph visualization for fraud detection.